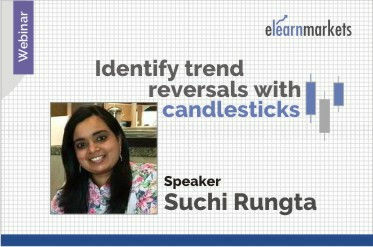 Mrs. Suchi Rungta (B.Com, CFA, CMT level 2) has described the basic concepts of Identifying Trend Reversals with Candlesticks. In this Video, She has discussed about candlesticks, bullish and bearish patterns and various other aspects. This webinar is suitable for students and active traders alike. Students will learn how to avoid how to identify trend reversals with candlestick charting methods. Active traders and investors will be able to rectify their mistakes in identifying trend reversals. Technical analysis is a very vast subject and to gain a complete understanding of it have a look at our Elliot Wave course. For more choice of technical course, view our entire range of technical analysis courses. Suchi has an experience of over eight years in the capital market, especially in the field of Trading, Technical Analysis& Equity Research. She is also proficient in trading derivatives and is dexterous with various trading software. She is also an active trainer for the past four years.